As President Donald Trump prepares to deliver his speech to a joint session of Congress on Tuesday, most voters say he has kept his promises to the American people during his first month in office. 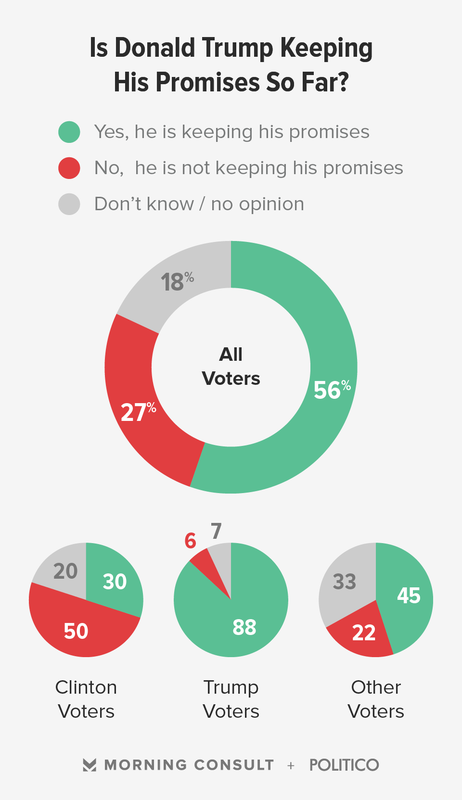 According to a new Morning Consult/POLITICO poll, 56 percent of Americans think Trump is keeping the promises he made on the campaign trail. About a quarter (27 percent) of Americans said he is not. On the campaign trail, Trump promised a lot. He pitched voters on a broad “America first” pledge — reinforced during his inaugural address — aimed at strengthening the country’s manufacturing sector and improving the job market, as well as “draining the swamp” of influence in Washington. He also vowed to cut regulations, ramp up deportations of undocumented immigrants, build a wall along the U.S.-Mexico border, slow the flow of refugees and immigrants into the U.S., repeal President Barack Obama’s signature health care law and “drain the swamp” of political corruption. And while Trump has taken steps to accomplish some of these goals — mostly via executive action — it’s too early to determine how successful he will be in pushing his agenda through. But, most voters say he’s delivering so far. Trump’s voters are particularly impressed. 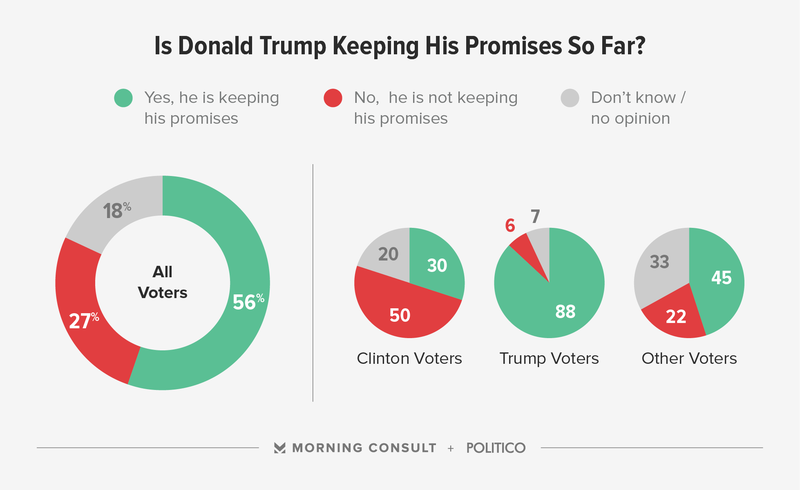 Nine in 10 of them (88 percent) said he is keeping his promises, while just six percent said he is not. Half of people who voted for his Democratic rival, Hillary Clinton, said Trump was not keeping his promises, though almost one-third (30 percent) said he was. And of the voters who opted for another candidate in 2016, a strong plurality (45 percent vs. 22 percent) said Trump was delivering. A third of voters (33 percent) said Trump has accomplished more than they expected since he took office in January, while 36 percent said he has accomplished about as much as they expected him to. More than half of Trump’s supporters (56 percent) said Trump has accomplished more than they expected, while about 4 in 10 (39 percent) of Clinton’s voters said he’d accomplished about as much as they expected. Voters are also feeling more optimistic about the country’s direction. In our new poll, 43 percent said the U.S. is headed in the right direction, while 57 percent said it was on the wrong track. Voter sentiment on the country’s future has ebbed and flowed slightly in recent weeks after reaching a 22-month high following Trump’s first week in office. For comparison, 71 percent said the country was on the wrong track on the day after Election Day. Trump’s approval numbers among registered voters also hit a new high over the weekend, with 50 percent approving of his performance, compared with 45 percent who do not. The margin has remained relatively steady during his presidency, dipping to its lowest point — 47 percent approve vs. 46 percent disapprove — in the wake of his controversial travel ban’s implementation. His positives have risen, albeit slightly, consistently since then, while his negatives have remained in stasis. The national, online survey polled 2,000 registered voters on Feb. 24-26. It has a margin of error of plus or minus 2 percentage points. See more here.